Image © [caption id="" align="alignnone" width="566"] © Arash Razzagh Karimi, Tehran, Iran[/caption] Iran is an enigma. To put it more accurately Iran is a 2,500 year old enigma, wrapped up a mystery. It’s a land burdened by history, geography and politics and yet at the same time it’s a place which unmistakably modern. It is a country which is under threat, sanctioned and internationally isolated and yet its people are globalised and in-touch with the world. It is one country but one country with multiple and diverging realities This is perhaps the best description anyone can offer of Iran, it’s a country that will shock, surprise and impress any visitor. The western image of Iran as a rogue, terrorist and backward nation does not correspond to the reality of this place and its people. The Iranian capital Tehran is a modern metropolis with high rising buildings and apartments dominating the city’s skyline. Looking at the modern infrastructure of Tehran you could be mistaken for being in Beijing or Dubai. The first thing that strikes any first time visitor to Tehran is the sheer scale and size of the city. There are traffic jams at 2 am as Tehran is a terribly congested city, the traffic is little better at 2pm the streets are almost always chock-a block. A look at demography reveals that Tehran is bigger than either New York or London, with a residential population of 12-14 million. Add to this an additional 6 million people who come into Tehran daily for work bringing the day-time population to 20 million. The people are always anxious but friendly and very warm towards foreign visitors. The main cause of anxiety is the dire economic conditions Iranians find themselves in. Iranians cite three reasons for the harsh economic realities firstly, the financial meltdown in the global economy. Secondly, Economic and financial mismanagement of the government and thirdly, the tough economic sanctions imposed on Iran over the last year. A small example of this occurred to me when I tried to change money. On my first day in Iran, I went to the money exchange place with an Iranian friend of mine. The Iranian friend asked me “how much do you want to change?” I replied “£80-100” and he replied “That’s too much, you will not spend that amount in a day. Change no more than £30”. I did as my friend advised and when I handed £30 over to the cashier I got the shock of my life. I was given the largest wad of cash I have ever seen, it was in the excess of Millions of Iranian Rials. It was so much money, that it wouldn't fit in my wallet causing me great difficulty. My friend’s advice turned out to be sound as the next day the value of the Iranian Rial fell by 17%. It turns out that since January 2012 with the implementation of the new sanctions the Iranian Rial has lost 80% of its value against the US dollar. On my third day in Iran the pressure of the currency fall led to clashes and demonstrations by Bazaar merchants against the authorities. In response to these protests the police raided all illegal money-changers in the traditional market or Bazaar and ordered all legal money-changers shut. During the demonstrations mobile phone networks went down and information was slow. The money-changers were closed for two-days and whilst closed the government introduced quantitative easing and printed more money. The little incident demonstrated the level of tension in the air and the central issue at next year’s presidential election. The incident terrified the regime as the economic and political backbone of the regime is in the traditional markets or Bazaars. Tehran is two cites, in one the Bazaars form a core part of South Tehran both politically and economically. The Bazaars looks like other traditional souks or bazaars in Istanbul, Damascus and other parts of the Middle East and North Africa. They are long, compacted, crowded, noisy and lively places to be. They sell everything from computers and technology to clothing, gold, food, handmade objects and more. Tehran’s Bazaar is perhaps the biggest Bazaar in the world it is however not that old. The Grand Bazaar (Tehran’s main Bazaar) is dated to be about 200 years old, which compared to the Souks in Damascus which go back 5,000 years is not that old. 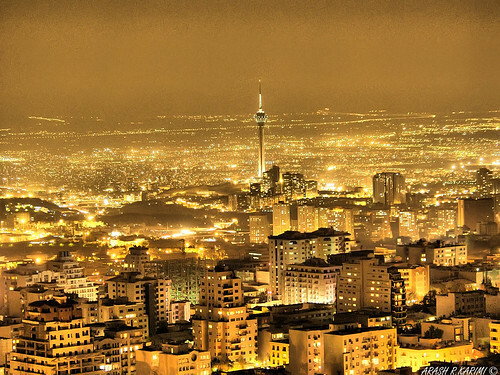 Tehran is a new city, but a new city, in an old country and civilisation. The merchants who work in the Bazaars are called Bazaaris they are considered to be vital to Iran’s traditional economy. In sociological terms they are conservative and religious and they enjoy a mixed relationship with ruling regimes in the past and present. They played a pivotal role in ousting the Shah’s regime in 1979 and putting into place the Islamic republic. The Islamic regime relies on them for support and thus riots and protest from them shakes the regime. Although on my visit the Bazaars were bustling signs of economic meltdown were visible. Prices were inflating and goods were becoming more expensive and in some cases harder to come by. This includes basic goods such as Coffee which is mostly imported has become scarcer. The South of Tehran which is economically quite poor has been hit hard by the sanctions and economic mismanagement. The North of Tehran by contrast is the image of excessive wealth. Valiasr street is a world of luxury shopping. The number of international brands available is astounding and this is in-spite of the sanctions. There also appears to be a building boom in North Tehran, whereby construction is under way on most streets. Eating out at Western style restaurants and fast food places is the fashion amongst North Tehranies. Most of these fast-food places are modelled on American brands with an Iranian twist, you can eat at McMashallah or Kentucky house. The unfortunately named Bobby Sands burger on Bobby Sands Street is a favourite among Young Tehranies. It is clear that the West is not entirely rejected as perceived by most commentators. However, what this does demonstrate is that the gap in wealth, between ‘the two Tehran’s’ has caused a gap in lifestyle and in politics. I am to pick up on this theme is my next instalment. Iran is an enigma. To put it more accurately Iran is a 2,500 year old enigma, wrapped up a mystery. It’s a land burdened by history, geography and politics and yet at the same time it’s a place which unmistakably modern. It is a country which is under threat, sanctioned and internationally isolated and yet its people are globalised and in-touch with the world. It is one country but one country with multiple and diverging realities This is perhaps the best description anyone can offer of Iran, it’s a country that will shock, surprise and impress any visitor. The western image of Iran as a rogue, terrorist and backward nation does not correspond to the reality of this place and its people. The Iranian capital Tehran is a modern metropolis with high rising buildings and apartments dominating the city’s skyline. Looking at the modern infrastructure of Tehran you could be mistaken for being in Beijing or Dubai. The first thing that strikes any first time visitor to Tehran is the sheer scale and size of the city. There are traffic jams at 2 am as Tehran is a terribly congested city, the traffic is little better at 2pm the streets are almost always chock-a block. A look at demography reveals that Tehran is bigger than either New York or London, with a residential population of 12-14 million. Add to this an additional 6 million people who come into Tehran daily for work bringing the day-time population to 20 million. The people are always anxious but friendly and very warm towards foreign visitors. The main cause of anxiety is the dire economic conditions Iranians find themselves in. Iranians cite three reasons for the harsh economic realities firstly, the financial meltdown in the global economy. Secondly, Economic and financial mismanagement of the government and thirdly, the tough economic sanctions imposed on Iran over the last year. A small example of this occurred to me when I tried to change money. On my first day in Iran, I went to the money exchange place with an Iranian friend of mine. The Iranian friend asked me “how much do you want to change?” I replied “£80-100” and he replied “That’s too much, you will not spend that amount in a day. Change no more than £30”. I did as my friend advised and when I handed £30 over to the cashier I got the shock of my life. I was given the largest wad of cash I have ever seen, it was in the excess of Millions of Iranian Rials. It was so much money, that it wouldn’t fit in my wallet causing me great difficulty. My friend’s advice turned out to be sound as the next day the value of the Iranian Rial fell by 17%. It turns out that since January 2012 with the implementation of the new sanctions the Iranian Rial has lost 80% of its value against the US dollar. On my third day in Iran the pressure of the currency fall led to clashes and demonstrations by Bazaar merchants against the authorities. In response to these protests the police raided all illegal money-changers in the traditional market or Bazaar and ordered all legal money-changers shut. During the demonstrations mobile phone networks went down and information was slow. The money-changers were closed for two-days and whilst closed the government introduced quantitative easing and printed more money. The little incident demonstrated the level of tension in the air and the central issue at next year’s presidential election. The incident terrified the regime as the economic and political backbone of the regime is in the traditional markets or Bazaars. Tehran is two cites, in one the Bazaars form a core part of South Tehran both politically and economically. The Bazaars looks like other traditional souks or bazaars in Istanbul, Damascus and other parts of the Middle East and North Africa. They are long, compacted, crowded, noisy and lively places to be. They sell everything from computers and technology to clothing, gold, food, handmade objects and more. Tehran’s Bazaar is perhaps the biggest Bazaar in the world it is however not that old. The Grand Bazaar (Tehran’s main Bazaar) is dated to be about 200 years old, which compared to the Souks in Damascus which go back 5,000 years is not that old. Tehran is a new city, but a new city, in an old country and civilisation. The merchants who work in the Bazaars are called Bazaaris they are considered to be vital to Iran’s traditional economy. In sociological terms they are conservative and religious and they enjoy a mixed relationship with ruling regimes in the past and present. They played a pivotal role in ousting the Shah’s regime in 1979 and putting into place the Islamic republic. The Islamic regime relies on them for support and thus riots and protest from them shakes the regime. Although on my visit the Bazaars were bustling signs of economic meltdown were visible. Prices were inflating and goods were becoming more expensive and in some cases harder to come by. This includes basic goods such as Coffee which is mostly imported has become scarcer. The South of Tehran which is economically quite poor has been hit hard by the sanctions and economic mismanagement. The North of Tehran by contrast is the image of excessive wealth. Valiasr street is a world of luxury shopping. The number of international brands available is astounding and this is in-spite of the sanctions. There also appears to be a building boom in North Tehran, whereby construction is under way on most streets. Eating out at Western style restaurants and fast food places is the fashion amongst North Tehranies. Most of these fast-food places are modelled on American brands with an Iranian twist, you can eat at McMashallah or Kentucky house. The unfortunately named Bobby Sands burger on Bobby Sands Street is a favourite among Young Tehranies. It is clear that the West is not entirely rejected as perceived by most commentators. However, what this does demonstrate is that the gap in wealth, between ‘the two Tehran’s’ has caused a gap in lifestyle and in politics. I am to pick up on this theme is my next instalment.